My neighbor Dave wandered into my yard the other day and we lied to each other about what we were planning to accomplish in our gardens by season’s end. I mentioned one event definitely taking place on my humble half-acre during the winter: The removal of three excruciatingly mature trees (an oak, an elm, and, to be fair, a maple) from my front yard. Dave withered, slumped, his face grew white and his eyes started rolling back in their sockets. He recovered, gave a low whistle, looked at his shoes, shook his head. I knew what was coming. Since we were standing beside the maple, he started his cross-examination there. “You’re going to take down this maple? This beautiful tree?” he asked. The maple in question is forty-five feet tall will a crown width of around twenty-five feet. It’s a Norway, Acer platanoides, referred to by many in these parts as a “black” maple. I pointed out to David that the tree in question had been pruned, badly, as a youngster, so that the trunk now splits into two large trunks at a point about seven feet above the ground. The dual trunks immediately curve in parallel to the southwest, and exhibit all manner of lesions, cracks, and wounds. The crown is jagged, lop-sided, and gives the impression the tree is off balance. It has never provided any noteworthy fall color display. Despite my pruning and the professional trimming I paid for a decade ago, it remains the ugliest maple in Deephaven, and that’s saying something. The final strike against it is that whereas it sits in a good spot for a tree, it’s the wrong tree for the spot. It’s too close to my house for a large tree, it’s out of scale, it looms over and clutters my driveway, and it shades an area in front of my house for five hours in the afternoon. Plus, as I’ve already stated, it’s ugly. A proper gardening solution? Remove it. The best advice I can give new gardeners, particularly those who have just purchased a home and yard, is FIX YOUR TREE SITUATION FIRST. Had I taken the maple out fifteen years ago, and planted in its spot the tree that I’ll be planting next spring (an Eastern Redbud), the redbud would be sixteen feet tall by now, nearing its max, and looking gorgeous. I’m always floored by people’s reactions to the thought of having trees removed from their yards. 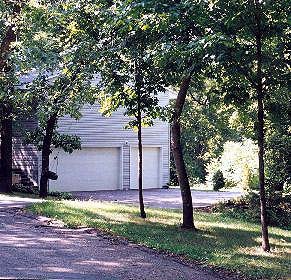 Where I live, many of the trees in literally a thousand yards were not planned, were not planted as an element of landscape design. They just grew, maples especially. I refer to maples in ridiculous locations in a yard as a “Deephaven Maple,” and every spring I remove over a hundred of them from my front, back and side yards. These trees are an inch or two tall and are sprouting up from the previous year’s seed drop. Every spring, everyone in my neighborhood does the same. Fail to do it and ten years from now, one would have a thousand, twelve-foot maples growing on a half-acre lot. But that never bothers anyone, removing over a thousand maples from their yards in a decade, because they are young. But let a few grow until they cause problems, then cut one down, and you get anonymous letters in the mail. How many big trees were removed when my house was built in 1946? Ten? Twenty? Fourteen very large trees remained when I bought the house, so I imagine at least ten were given the ultimate prune by the builder when he put in the foundation and driveway. No one ever thinks about that. People who live in their $550,000 wood homes and decry the loss of six trees when a builder finally wrestles away ownership of an undeveloped lot across the street from them don’t ever think about the fifteen trees that were cut down when their house was built. Or the forty that were cut down to supply the lumber for it. Two of my original fourteen trees — classic Deephaven Maples — were in my back yard, too close together, right off my patio, blocking the view from my kitchen and dining room windows. They existed for no reason except they hadn’t been pulled by a previous owner when they were a few inches high. I neglected them, and one died, gratefully, following the drought of the early 1980s. When I took it out I took the other one out. Everyone hears about the deforestation of the various rain forests on the globe, particularly in South America, and many people curse logging (sometimes justly, sometimes unjustly), but these situations don’t equate to tree removal in residential landscapes. In fact, it’s fair to say that the number of trees being planted (and new trees slowly working their way to one hundred-year-old status) in residential America are up from previous decades. Proof? Development of the southern, western, and northern, second-ring suburbs of Minneapolis — and probably your nearest city. These were farmlands, some as close as two miles from my current home. They were clear-cut by farmers one hundred and fifty years ago, and farmed for generations. Guess what? The U.S. doesn’t need as much farmland as it once did; yield per acre is much higher than it was in the 1800s, or the 1950s, for that matter. All across Minnesota, treeless farmland is being turned into residential home developments, with, granted, ghastly street names. But my point is that trees are being planted, by the thousands across the Twin Cities, and by the millions across America. Deephaven maple after new home construction: Would you plant a tree there? Builders are getting better at not dooming so many trees when they do build homes, and have learned not to change the soil level around trees they want to save. New, disease resistant strains of trees, from crabapples to elms, are being developed and marketed, and nurseries can’t keep up with demand from builders, landscapers and homeowners. Getting back to my trees, the maple, as discussed, is history. The elm is coming down (I explained to Dave) because it’s very old, parts of it have been lost in numerous storms, and if I leave it up it will certainly go down in a storm, possibly on my house, within the next five years. It’s also in a really dumb spot, smack in front of my house, up way too close. The red oak, which sits eight feet from the elm, is a nice-looking tree but is also in a dumb spot, even closer to my house (twelve feet) than the elm. This oak is fifty feet tall and could well be one hundred years old. I’ve debated the oak, but decided finally to take it out because in my new front yard plan, I’d never put any type of tree where it stands. I’m having it removed in eight, ten and twelve-foot lengths, then calling up a friend of mine with a portable sawmill he tows behind his pickup. Come spring he’ll saw it into 8″ x 8″s and 10″ x 10″s for use in an elaborate arbor structure I’m going to build off my home’s new addition. I like that. 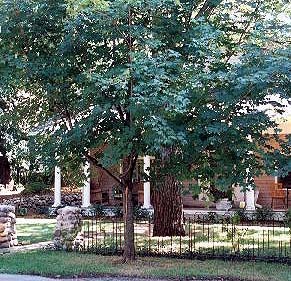 I’m sure one reason the elm and the oak were left (they most certainly existed before the house was built, and were not planted as a part of any landscape plan) was to shade and cool the house. They sit directly south. Air conditioning was not available to the original owner in the 1940s, so these two trees provided shade to the roof and front of the house in summer, then lost their leaves and allowed the sun to shine on the house in the winter. Well, I put in central air conditioning four years ago. This opens up my options. So I’m taking three trees out. Big ones. Before you phone the Sierra Club and report me, may I also point out that I am planting three trees in my yard. I mentioned this to Dave and he was immediately back to liking me, so I didn’t mention that my planting three trees was shear coincidence. You don’t need to plant a tree every time you take one down (see Tenet 11). Some people find that hard to believe. I was doing a yard consultation last week with a young couple down the road, nice house and lot, many beautiful trees, and as we walked around a corner of their house we came upon the second ugliest maple in Deephaven. Twenty years old, perhaps. A previous owner had hit the tree, repeatedly, with the mower blade, so that the trunk actually grew in a brazen “s” as it struggled for sunlight under a full canopy of far more mature trees. It was too close to the house, all alone, fixing to die in one of the few areas on the entire one-acre lot in which I would never plant a tree. The couple asked me what I thought about “the little maple.” It goes, I said. “That’s what the neighbors all say, but we wanted an expert opinion.” I know when to bite my tongue.